Windows Forms (WinForms) is a graphical (GUI) class library included as a part of Microsoft .NET Framework, providing a platform to write rich client applications for desktop, laptop, and tablet PCs. While it is seen as a replacement for the earlier and more complex C++ based Microsoft Foundation Class Library, it does not offer a comparable paradigm and only acts as a platform for the user interface tier in a multi-tier solution. Windows Forms provides access to native Windows User Interface Common Controls by wrapping the extant Windows API in managed code. 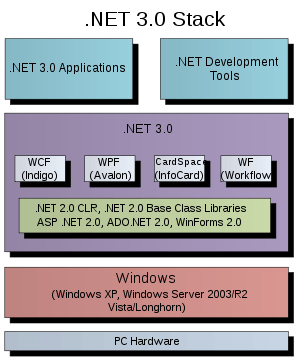 With the help of Windows Forms, the .NET Framework provides a more comprehensive abstraction above the Win32 API than Visual Basic or MFC did. All visual elements in the Windows Forms class library derive from the Control class. This provides a minimal functionality of a user interface element such as location, size, color, font, text, as well as common events like click and drag/drop. The Control class also has docking support to let a control rearrange its position under its parent. The Microsoft Active Accessibility support in the Control class also helps impaired users to use Windows Forms better. Besides providing access to native Windows controls like button, textbox, checkbox and listview, Windows Forms added its own controls for ActiveX hosting, layout arrangement, validation and rich data binding. Those controls are rendered using GDI+. Just like Abstract Window Toolkit (AWT), the equivalent Java API, Windows Forms was an early and easy way to provide graphical user interface components to the .NET Framework. Windows Forms is built on the existing Windows API and some controls merely wrap underlying Windows components. Some of the methods allow direct access to Win32 callbacks, which are not available in non-Windows platforms. In .Net 2.0, Windows Forms gained richer layout controls, office 2003 style toolstrip controls, multithreading component, richer design-time and data binding support as well as ClickOnce for web-based deployment. With the release of .NET 3.0, Microsoft released a second, parallel API for rendering GUIs: Windows Presentation Foundation (WPF) based on DirectX, together with a GUI declarative language called XAML. During a Q and A session at the Build 2014 Conference, Microsoft explained that Windows Forms was under maintenance mode, with no new features being added, but bugs found would still be fixed. Most recently, improved high-DPI support for various Windows Forms controls was introduced in updates to .NET Framework version 4.5. Mono is a project led by Xamarin (formerly by Ximian, then Novell) to create an Ecma standard compliant .NET compatible set of tools. Mono's support for System.Windows.Forms as of .NET 2.0 is announced as complete; also System.Windows.Forms 2.0 works natively on Mac OS X. However, System.Windows.Forms is not actively developed on Mono, and full compatibility with .NET is not achieved and is not possible, because Microsoft's System.Windows Forms is mainly a wrapper around the Windows API, and some of the methods allow direct access to Win32 callbacks, which are not available in platforms other than Windows. ↑ Sells, Chris (September 6, 2003). Windows Forms Programming in C# (1st ed.). Addison-Wesley Professional. p. xxxviiii. ↑ "Design and Implementation Guidelines for Web Clients by Microsoft Pattern and Practices". Microsoft. November 2003. ↑ Sells, Chris; Weinhardt, Michael (May 16, 2006). "Appendix B". Moving from MFC, Windows Forms 2.0 Programming (2nd ed.). Addison-Wesley Professional. ↑ "Introduction to Windows Forms" (Visual Studio 2003 documentation). Microsoft 2003. ↑ De Smet, Bart (January 4, 2011). "Chapter 5". C# 4.0 Unleashed. Sams Publishing. ↑ Griffiths, Ian; Adams, Matthew (March 2003). NET Windows Forms in a Nutshell. O'Reilly Media. p. 4. 1 2 Griffiths, Ian; Adams, Matthew (March 2003). NET Windows Forms in a Nutshell. O'Reilly Media. pp. 27–53. ↑ Sells, Chris; Weinhardt, Michael (May 16, 2006). "Appendix A. What s New in Windows Forms 2.0". Windows Forms 2.0 Programming (2nd ed.). Addison-Wesley Professional. ↑ Noyes, Brian (January 12, 2006). "Preface". Data Binding with Windows Forms 2.0: Programming Smart Client Data Applications with .NET (1st ed.). Addison-Wesley Professional. ↑ Hall, Gary (December 27, 2010). "DirectX, not GDI+". Pro WPF and Silverlight MVVM: Effective Application Development with Model (2010 ed.). Apress. p. 2. ↑ Smith, Josh (2007-09-05). "WPF vs. Windows Forms". Josh Smith on WPF. Retrieved 2011-08-25. WPF is not intended to replace Windows Forms. [...] Windows Forms is still alive and well, and will continue to be enhanced and supported by Microsoft for years to come. WPF is simply another tool for Windows desktop application developers to use, when appropriate. ↑ Allen, Jonathan (2014-05-06). "High DPI Improvements for Windows Forms in .NET 4.5.2". InfoQ. Retrieved 2015-02-10. ↑ "WinForms". mono-project.com. Retrieved 2011-07-30. Support for Windows Forms 2.0 is complete. At this point, we are largely just fixing bugs and polishing our code. ↑ de Icaza, Miguel (2011-03-07). "GDC 2011". Retrieved 2011-07-30. For tools that are mostly OpenGL/DirectX based, use Windows.Forms, keeping in mind that some bug fixing or work around on their part might be needed as our Windows.Forms is not actively developed.